St. James Church in Sulgrave, England, is a quarter mile from the Sulgrave Manor House. On the church grounds are buried Lawrence Washington, builder of the Manor House, and his wife Amee. Capt. Lawrence Washington(56) (1635-abt. 1676), the second son of (64)Rev. 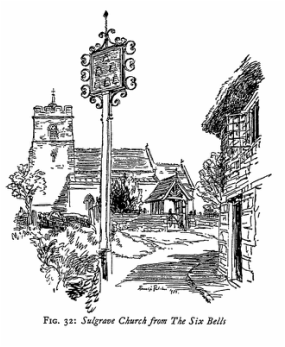 Lawrence Washington, was baptized at Tring in Hertfordshire on the 18th of June 1625, made a journey to Virginia and acquired land there in 1659. His interests in America necessitated frequent journeys and he soon settled in Virginia. He first acquired land in Westmoreland Co. as did his brother John. He soon acquired land in Rappahannock Co. (now Essex Co.) where he established his home. Each of the brothers, Col. John and Capt. Lawrence Washington, named the other as executor of his will; the brothers died within a year of each other. 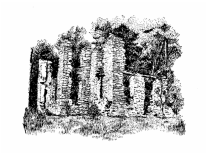 Ruins of St. George's Chapel near "Harewood," where early Washingtons worshiped. George Washington attended services on many of his trips to the valley. 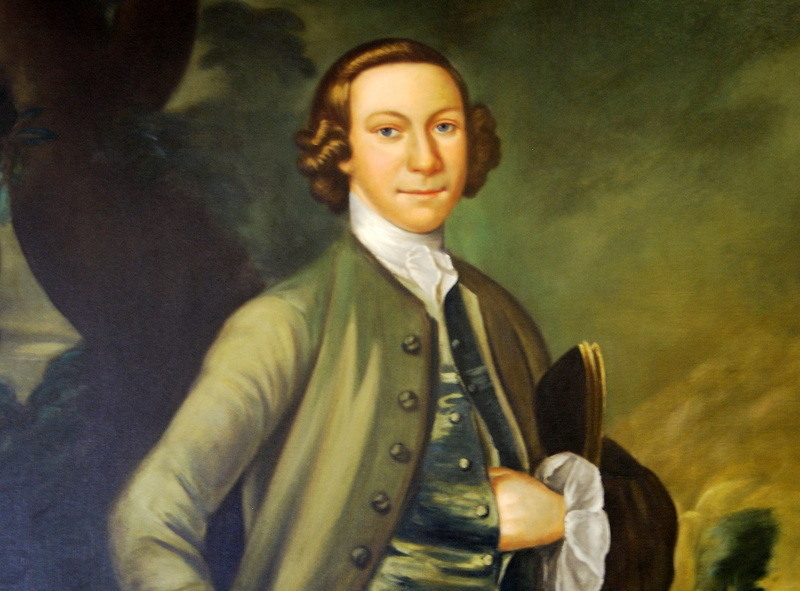 Col. Samuel Washington (4), born at "Wakefield," Westmoreland Co., Virginia 16 November 1734, was the third child of Mary, the daughter of Col. William Ball, and Augustine Washington (8). Samuel's father died when he was eight leaving his mother with five young children. Young Samuel, orphaned at the age of eight, was blessed in having such a loving, nurturing mother as Mary Washington. Samuel, as the oldest male left at home when his brother George embarked on his early career as a surveyor and soldier. Samuel must have grown in character as he assisted his mother in management of the family and farm. Samuel was afforded the best education offered locally at the Academy at Westmoreland County. Samuel inherited properties from his father in Stafford County and fifteen hundred acres of land in Frederick County, in what is now Jefferson County, from his half brother Lawrence who died childless in 1752. Samuel married and established a home at his Stafford Co., now King George County, property at Chotank 1755. In Stafford Count he served as justice of the peace, county magistrate, sheriff, militia officer, and parish vestryman. In 1766 he signed he Westmoreland Resolutions, written by Richard Henry Lee, a precursor of the Declaration of Independence protesting the Stamp Act. In 1768-69 Samuel was engaged in preparing to move to his Frederick County lands where he had John Arliss design a new house and Samuel. 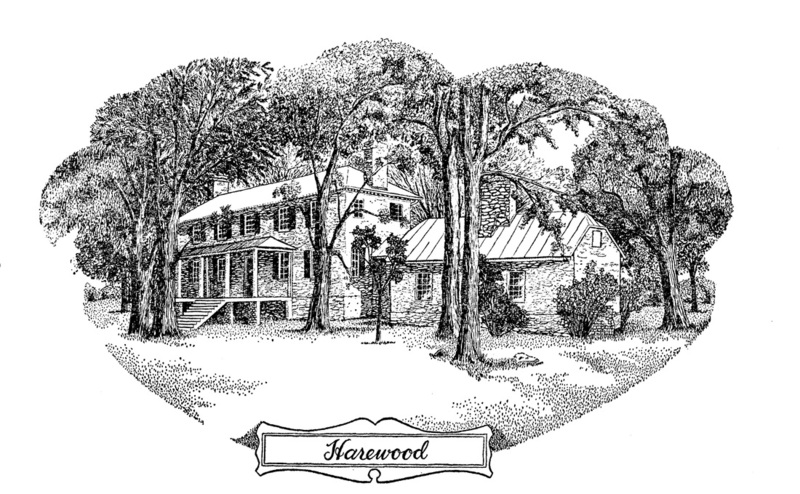 Samuel's new home in Frederick County was named "Harewood." He was sworn in as justice of the County Court, as vestryman of Norborne Parish and as Colonel of the county militia. Samuel Washington was married five times. By his wives he had no less than six children who died in infancy or in youth and three of his four sons who survived childhood died of tuberculosis. Similarly, the five wives died within one to five years of marriage to Samuel. 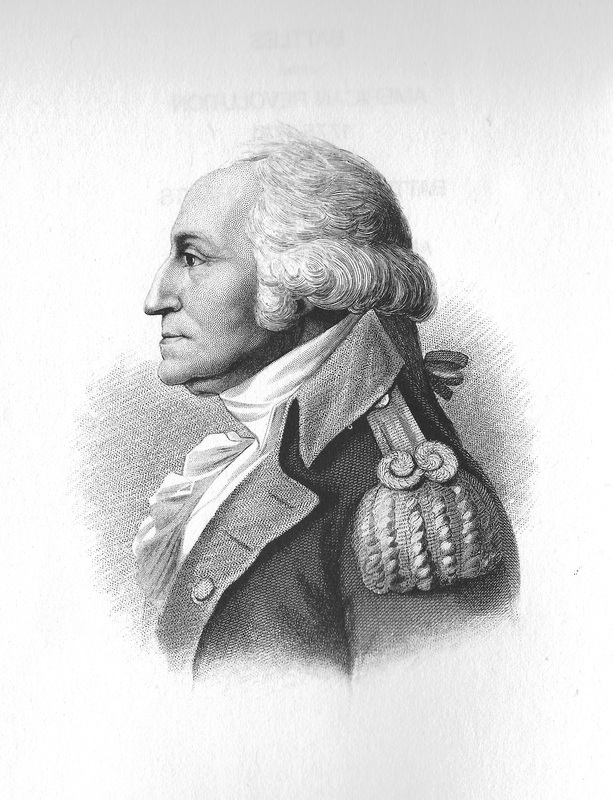 Our outstanding authority on the Washington family, John A. Washington of Chevy Chase, Maryland  has considered this situation fully, knowing that Samuel Washington was consumptive all his life, infers that the early deaths of successive wives and the high mortality rate of his children was due to contracting tuberculosis from Samuel Washington. The avoidance of the continuation of this deadly process was impossible because of the lack of knowledge of communication of disease n this period. By his marriage to Mildred Thornton, Samuel left a son, Thornton Washington (2) who grew to manhood and produced offspring. 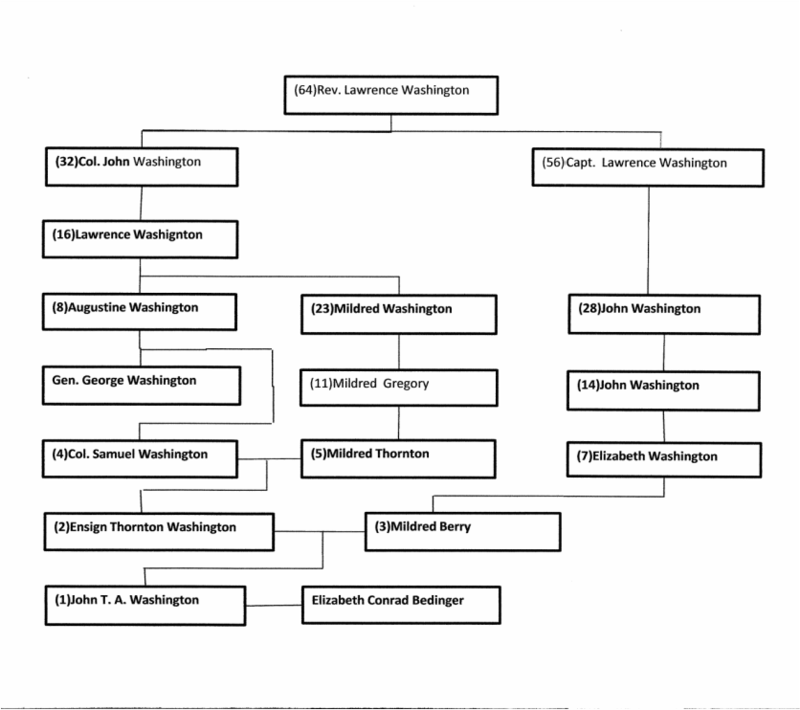 More information about George and Samuel Washington and the Washingtons of Jefferson County, West Virginia can be found in the interview of the family historian, John Augustine Washington, "The Washington Family of Jefferson County". In the interview, John A. Washington says, "when you think about Col. Samuel Washington, it's hard not to think of him as the one that was married five times and died at the age of forty-seven. It wasn't his fault - or maybe it was - that his wives died at such a rapid rate. It's pretty clear that he had tuberculosis which we now know is a contagious disease and tuberculosis and pregnancy and childbirth do not go well together. The strain of pregnancy is very difficult for a woman who has tuberculosis. I've always thought that his young wives who kept dying so quickly had caught tuberculosis from him, became pregnant, and soon died as a result of the combination." A biography of Samuel Washington by John A. Washington is reprinted in this website. Stone building once used by Samuel Washington as his office. Drawing is by William D. Eubank from "The Washington Homes of Jefferson County, West Virginia" by Charlotte Judd Fairbain, Whitney & White Publisher, Ranson, West Virginia. Harewood, Jefferson Co., West Virginia, the home of Col. Samuel Washington. Drawing is by William D. Eubank from "The Washington Homes of Jefferson County, West Virginia" by Charlotte Judd Fairbairn, Whitney & White, Ranson, West Virginia. Ensign Thornton Washington(2), the first child of Col. Samuel Washington(4) by his second wife Mildred Thornton(5), was born in King George County, Virginia in 1760. Thornton moved with his father to Frederick Co.,Virginia (later Berkeley Co. , now Jefferson Co., West Virginia) in 1770. Thornton Washington left his home to join the army before he was 16 years old and served as an ensign under his uncle Gen. George Washington. He was with Gen. Washington at Morristown, New Jersey, in 1777, and was sent by him to Virginia entrusted with an important public business matter and afterward rejoined the army. Thornton Washington married his first wife Mildred(3) daughter of Thomas Berry of "Berry Plain," the family seat in King George Co., Virginia in about 1782. Thornton settled with his wife on property near "Harewood" and built a commodious frame home that was named "Berry Hill." By his marriage to Mildred Berry were born two children. The first John Thornton Augustine Washington(1), born 20 May 1783, our Bedinger ancestor who lived to maturity. The second, Thomas Washington who died quite young. Mildred Berry died shortly thereafter, about 1785. Thornton Washington married a second wife, Francis Townsend Washington daughter of Lawrence Washington of King George Co., Virginia about 1786. She was a first cousin of his first wife. There was born to this union one son, Samuel Washington, on 14 February 1787. Thornton Washington died later the same year. Cedar Lawn, Jefferson Co,, West Virginia, the home of John Thornton Augustine Washington. 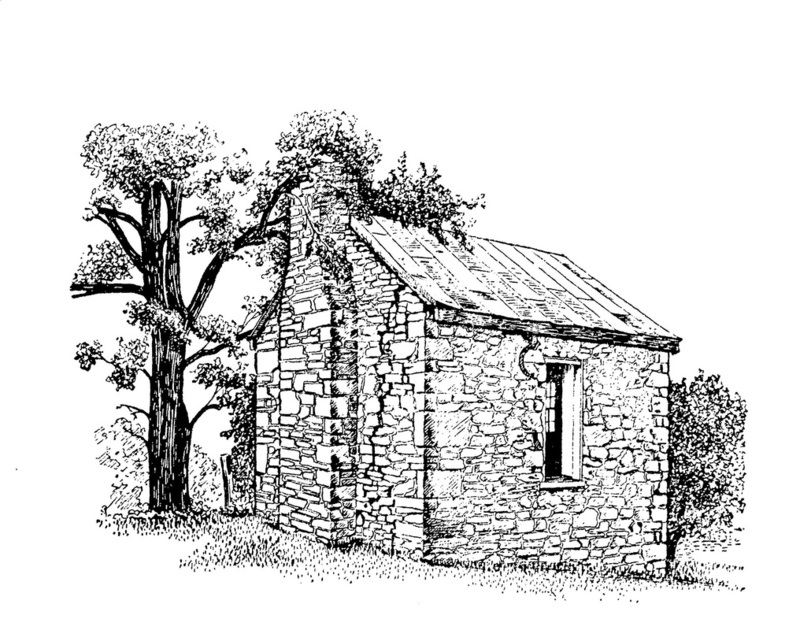 Drawing is by William D. Eubank from "The Washington Homes of Jefferson Co., West Virginia" by Charlotte Judd Fairbain published by Whitney & White, Ranson, West Virginia. John Thornton Augustine Washington (1) the first child of Thornton Washington(2) and his wife Mildred Berry (3) was born in "Berry Hill", Berkeley Co., Virginia 24 September 1810. John T. A. Washington was about four years old when he was left an orphan. His uncle and guardian, Lawrence Berry, of "Berry Plain", King George Co., Virginia removed him from Jefferson Co., to his own home where he remained until old enough to assume control of his estate in Jefferson Co. and where he afterwards resided continuously until his death 7 October 1841. John Thornton Augustine's first residence at his estate was a commodious frame building for those early days and the site of it was known as "Berry Hill,' where his first nine children were born. 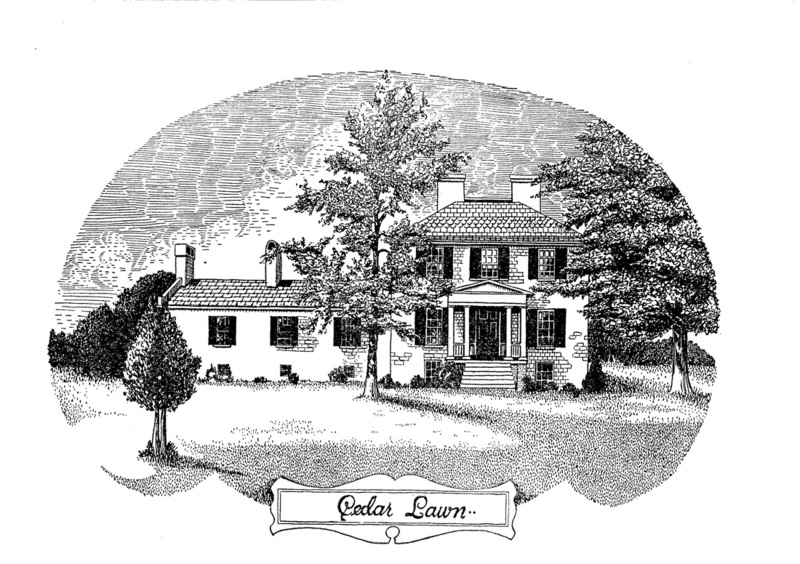 When the "new house" was built, about 1825-1826, it was called "Cedar Lawn." This new residence was of brick, burned on the spot, and was constructed in the best style of country residences of the period. It was designed throughout by its owner, and was both spacious and attractive in appearance. Its surrounding improvements and ornamentation of grounds were excelled by those few residences in the valley. John Thornton Augustine Washington married 24 September 1810 Elizabeth Conrad Bedinger, daughter of Daniel Bedinger and Sarah Rutherford of "Bedford", Shepherdstown, Jefferson Co., Virginia (now West Virginia)." To this union thirteen children were born of whom one died in infancy and another at a very young age. Elizabeth Conrad Bedinger died 27 October 1837, barely a year before the death of her youngest daughter. The oldest daughter, Virginia Thornton Washington, after the death of her mother, took charge of domestic affairs of the home and the moral and educational training of the eight younger members of the family, until her untimely death 13 November 1838. Her younger brother Thornton Augustin remembered her as a devout church member with a great force of character. John T. A. Washington died four years after the death of his wife, at the age of 58 years, leaving ten offspring ranging in age from 30 to eight years of age. The children maintained a home together at “Cedar Lawn” for another fifteen years that provided for their education and religious upbringing. George, the youngest son, eleven years old at the death of his father, and two of his older brothers, Laurence Berry and Benjamin Franklin, studied law and each entered into the practice during their careers. Thornton Augustin, aged fifteen at his father’s death was educated , as presumably also were his brothers, at Charlestown Academy and at home under tutors. Thornton Augustine was a graduate of Princeton College and graduated the military academy of West Point in 1849. Benjamin Franklin was sole executor of his father’s estate and entered upon the responsible duties of its administration at the age of 21. The year 1856 found the family at “Cedar Lawn”, with the youngest, Susan Ellsworth at age of twenty- one years. The three older boys had embarked upon careers. Laurence Berry served as a lieutenant in Col. John Francis Hamtramck’s regiment of Virginia infantry during the Mexican War. He went to California in 1849 during the gold rush. Daniel Bedinger a farmer and sometimes editor and writer for political newspapers married Lucy Ann Washington, a cousin, in 1843 and removed to Putnam Co., Virginia in 1846. Benjamin Franklin entered into the practice of law at Charlestown and was married in 1845 to Georgianna Hite Ranson. In 1848, at the age of 18 George Washington took charge of “Cedar Lawn” farm; rented and worked the “Cedar Lawn” farm and the “Bullskin Farm” for six years, paying off all indebtedness of the estate and winding up its affairs with money ahead. In 1849, the discovery of gold in California prompted Benjamin Franklin to form a company and recruit men to make an expedition to the gold fields. George Anna Augusta married John Wheeler Smith in 1851. In the early 1850’s Mildred Berry met and fell in love with her second cousin Solomon Singleton Bedinger. They were married in 8 February 1854 at “Cedar Lawn”. Solomon Singleton Bedinger was the grandson of Maj. George Michael Bedinger of Lower Blue Lick Springs, Nicholas Co., Kentucky. Mildred Berry was the granddaughter of Daniel Bedinger, brother of Maj. George Michael Bedinger. These events were life-changing, but relatively calm compared to the cataclysmic events that were to follow over the next twenty years. These coming years would see huge challenges, tragedies, changes in fortunes and life styles met by personal and family resolve and strength. In 1855 George Washington divided up his father’s estate among to the satisfaction of the ten surviving heirs. In the spring of 1856, with the exception of two, Thornton Augustin W. and Benjamin Franklin W., the surviving heirs and their spouses moved to Missouri, where they purchased extensive tracts of the virgin soil of that state, locating themselves in Cass and Johnson Counties near the Kansas and Missouri boundary line and where during the coming war they were subjected to many of the horrible depredations inseparable from a warfare carried on upon the border by lawless and unbridled ruffians. The two who did not move to settle in Missouri were Thornton Augustine Washington was an officer in western outposts in the service of the U. S. Army and Benjamin Franklin Washington who had removed to California. 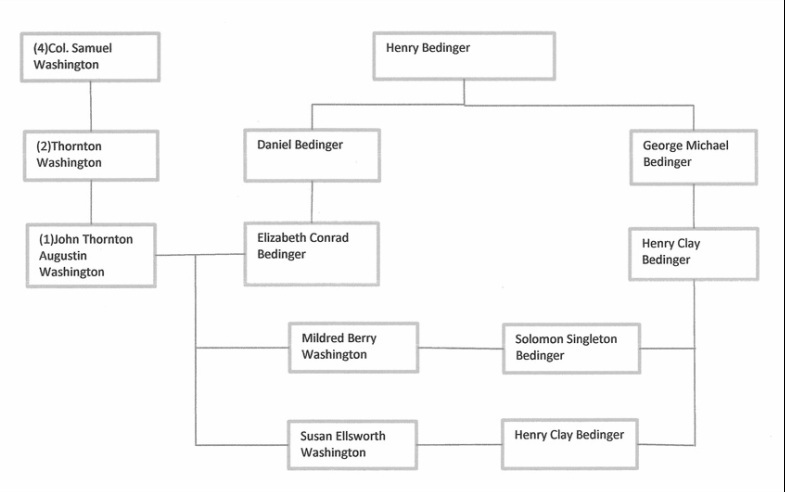 The enlarged family thus that removed to Missouri in 1856 included Daniel Bedinger Washington and wife, George Anna Washington and spouse, and Mildred Berry Washington and her spouse, Solomon Singleton Bedinger. The unmarried heirs in the move included Laurence Berry Washington, George Washington, Sarah Eleanor Washington, Mary Elizabeth Washington, Susan Ellsworth Washington. Notable among those who joined this pilgrimage to Missouri was Henry Clay Bedinger, younger brother of Solomon Singleton Bedinger. In May 22, 1857, Henry Clay Bedinger and Susan Ellsworth Washington were married at "Sunnyside" the Johnson Co., Missouri home of Solomon Singleton Bedinger and Mildred Berry Washington. Mary Elizabeth Washington married, 4 March 1858 at the home of her brother-in-law, Solomon Singleton Bedinger in Johnson Co., Missouri, to Squire Asbury, of "Asbury Hall," Johnson Co., Missouri. Sarah Eleanor Washington died, unmarried, at Johnson Co., Missouri, 21 January 1858. Among those who made the move to Missouri all except two kept their homes in Missouri through the duration of the border wars and the Civil War. Lawrence Berry Washington was lost from a steamboat near the town of Rocheport, Boone Co., Missouri 21 September 1856. Laurence was an author and poet of ability, and possessed a remarkable natural genius as an artist. He was well-versed in history and general literature. George Washington removed from Missouri to San Francisco, California in June 1857. In California he was cashier of customs, under his brother, B. F. Washington, during his administration as Collector of the Port of San Francisco. Several of the children of John T. A. Washington and Elizabeth Conrad Bedinger have been attributed to inheriting the literary and artistic skills of the Bedingers. 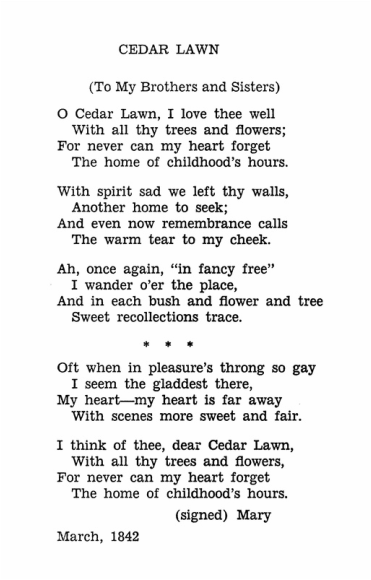 Mary Elizabeth wrote, following the death of her father, a charmingly nostalgic poem in remembrance of her happy days at her childhood home, "Cedar Lawn." Sarah (Sally) Eleanor Washington composed a series of poems in remembrance of her brothers and sisters. Laurence Berry Washington was the author of a novel, "Fifty Years Hence ," contributed articles to newspapers, was a poet of ability and possessed of remarkable genius as an artist. Daniel Bedinger Washington was sometimes an editor and writer for political newspapers. Benjamin Franklin Washington gave evidence of a decided taste for painting, poetry, and music; he was a chief contributor to the "Spirit of Jefferson," a Charlestown, Virginia Democratic newspaper. As a newspaper editor in San Francisco, he printed daily on the front page a poem he had composed. Thornton Augustin Washington, whose book is quoted here in this paragraph, in his modesty, does not himself mention his proficiency as an artist of pen and ink drawings. George Washington was for two years editor of the Daily and Weekly National, San Francisco, California. The poem "Cedar Lawn" by Mary Elizabeth Washington is printed in "The Washington Homes" by Charlotte Judd Fairbairn, who notes that the full poem was written in 14 stanzas. The brief notes on the literary and artistic proclivities of Mary's siblings are from "A Genealogical History of the Washington Family" by Thornton Augustine Washington. Numbers preceding the names of descendants are the identifying numbers in the Washington genealogy found in the "Related Families" page of this website and in the Washington Chart at the beginning of this page. Horizontal lines in the chart represent a marriage connection between individuals, i.e., as between (1)John Thornton Augustine Washington and Elizabeth Conrad Bedinger. Lines connecting vertically separated individuals represent descent from upper to lower individual. Smith, Clifford H., 1933, Sulgrave Manor and The Washingtons: Jonathon Cape, thirty Bedford Square, London,160 p.
 McCartney, Martha W, 2012, Jamestown People to 1800, Genealogical Publishing Company,514 p.
 Hoppin, Charles Arthur, 1932, Colonel John Washington and his brother Captain Lawrence Washington, New York, N. Y., reprinted by Quintin Publications, Pawtucket, Rhode Island, 229 p.
 Fairbairn, Charlotte Judd, 1965, The Washington Homes of Jefferson County, West Virginia, Blue Ridge Press, Berryville, Virginia, 36 p.
 Washington, John A., 1970, Samuel Washington, in The Magazine of the Jefferson Conty Historical Society,vol. XXXVI, pp. 16-23. Washington, George, 1892, Journal of My Journey over the Mountains in 1747-48, Copy from Original, Edited with Notes by J. M. Toner, Joel Munsell's Sons, Publishers, Albany, NY, 144 p. Available on internet, https://archive.org/stream/journaljourney00washrich#page/n5/mode/2up . Washington,Thornton Augustin, 1891, A Genealogical History beginning with Colonel John Washington, the Emigrant, and head of the Washington Family in America, Press of McGill & Wallace, Washington, D. C., 71 p.